In a medium-sized bowl add the cream of mushroom soup, milk, salt, pepper and thyme. Whisk until smooth. Set aside. 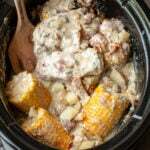 Add the frozen corn standing them up on their ends in a ring around the outer edge of the slow cooker. Add potatoes in the middle of the corn. Sprinkle over onion. Add the pork chops on top of the corn and potatoes. Sprinkle over the cooked bacon. Spread over the soup mixture over the top of everything. Nutritional Values are approximate, if you require a special diet, please use your own calculations. Values below are for 1/6 of the recipe.